Do you think you have the same freedom of expression at your workplace? Think again. 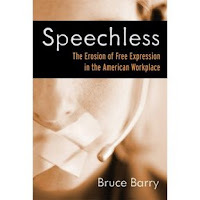 The American Booksellers Foundation for Free Expression has a short but interesting interview with Bruce Barry about his book Speechless. Check it out and get rid of all those bumper stickers!